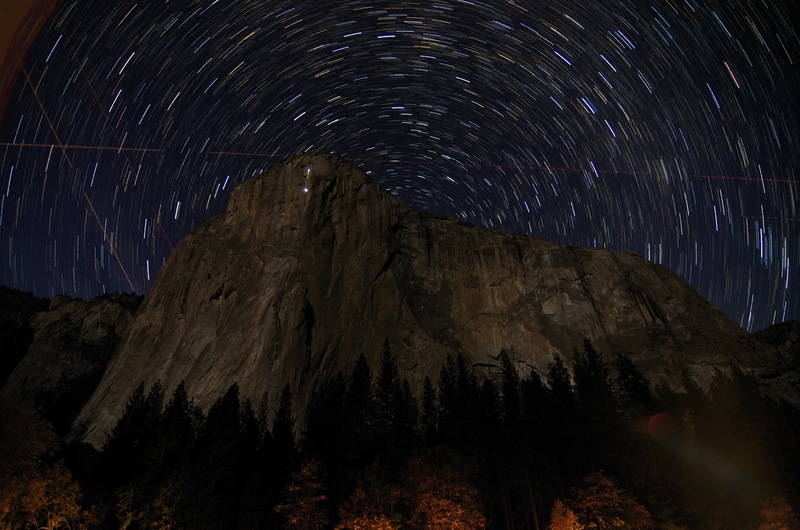 Explanation: Towering 3,000 feet from base to summit, the famous granite face of El Capitan in Earth's Yosemite National Park just hides the planet's north celestial pole in this skyscape. Of course, the north celestial pole is at the center of all the star trails. Their short arcs reflecting the planet's daily rotation on its axis are traced in a digital stack of 36 sequential exposures. Linear trails of passing airplane navigation lights and a flare from car lights along the road below are also captured in the sequential stack. But the punctuated trail of light seen against the sheer El Capitan itself follows a climbing team on the night of November 8, 2013. The team is ascending toward the summit along The Nose, a historic rock climbing route.